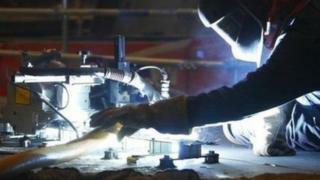 Growth in the UK's economy slowed in the three months to November, expanding at its weakest pace in six months. The economy grew by 0.3% during the period, less than the 0.4% in the three months to October, the Office for National Statistics (ONS) said.The ONS said manufacturers suffered their longest period of monthly falls in output since the financial crisis, being hit by weaker overseas demand.It also said the economy grew by 0.2% in November, up from 0.1% in October.Rob Kent-Smith, head of national accounts at the ONS, said: "Growth in the UK economy continued to slow in the three months to November after performing more strongly through the middle of the year. "Accountancy and house building again grew but a number of other areas were sluggish. "Manufacturing saw a steep decline, with car production and the often-erratic pharmaceutical industry both performing poorly." Month on month, construction growth was 0.6% in November. manufacturing contracted 0.3%, while services activity rose 0.3%.Production as a whole contracted 0.4%.Worries about the global economy, stoked by an ongoing trade spat between the US and China, have had knock-on effects for other economies, as well as the UK.Figures from Germany and France earlier this week similarly showed falling industrial output. The concern that Brexit uncertainty may be weighing on sentiment and spending has become all too familiar. But these GDP numbers suggest there's more to the cooling down of growth toward the end of last year - and worryingly so. They suggest demand from our trading partners is faltering. Industry suffered its most widespread fall in output since 2012, with a drop in car production leading the charge. Separate data showed that, once erratic items like aircraft orders were stripped out, the gulf between imports and exports - the trade deficit - widened to Commenting on the economic figures Ben Brettell, senior economist at Hargreaves Lansdown, said: "This marks the manufacturing sector's longest losing run since the 2008-09 recession. "There are two factors at work here. The global economy looks to be stuttering, with the 'Chimerica' trade war rumbling on, and Chinese consumer spending on a downward trend. "UK companies are also dealing with a significant Brexit headwind, with heightened levels of uncertainty putting business off investment and damaging consumer confidence."